New research on the brain’s reactions to two kinds of sugars offers insights into the way people find some sugary foods so inviting. The results are published in the current online edition of the journal Diabetes, Obesity and Metabolism (paid subscription required). Researchers from Oregon Health and Science University in Portland and University of California at Davis used functional magnetic resonance imaging (fMRI) that gives real-time measures of blood oxygen level in the brain to test the brain’s reactions to sugars. The team gave nine normal-weight individuals intravenous injections of fructose and glucose solutions, as well as a saline solution, then submitted the subjects’ brains to fMRI scans. The findings indicate the control areas in the brain’s cerebral cortex react in opposite ways to the sugar injections. The fructose solution inhibited the cortical control functions, while the glucose solution activated the control regions. These control functions affect human reactions to sensory stimuli, including what we see, smell, and taste. The researchers found no significant differences in the hypothalamus — the part of the brain involved in regulating food intake — after the sugar-solution injections. 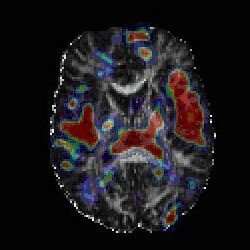 Nor did the saline solution affect the researchers’ fMRI readings on any part of the brain. Fructose, particularly in syrup form derived from corn, is a common sweetener added to many processed foods and soft drinks, and in large quantities is linked to weight gain and heart disease. Glucose is a simple sugar, also known as dextrose, found in table sugar and added to some packaged foods. However, it occurs naturally as well in honey, fruits, vegetables, dairy products, and grains. Just a quick note – fructose also appears in honey, fruits, and other foods. High fructose corn syrup is actually only 55% fructose. Names can be deceiving! Based on the fact that most foods have both glucose and fructose, it seems that most of the time the brain would be doing both processes described here in response to food. For some really cool info on different sugars and how they affect us (up to date except for this study), check out High Fructose Corn Syrup: Tasty Toxin or Slandered Sweetener? on Science Based Medicine.